I’m pleased that my Ask Me Anything on AI was well attended. Here are the some of the best questions asked. AI is considered superhuman, typically a program which is written by humans to perform tasks at a superhuman level. Machine learning doesn’t rely on humans to find relationships in the data it observes, but it learns itself the importance of different data in making its decisions. Therefore, ML often finds relationships or solves problems very differently than we do, which is why it can be very powerful. Google Maps is an example of AI, and models that find pictures of cars or cats in random photos are an example of machine learning. It’s hard — think of that classic “Is it a blueberry muffin or a chihuahua?” meme. Can your AI technology catch money laundering? AI combined with ML can be used to determine normal and abnormal patterns of behavior using massive amounts of transaction data. Determining normality, or how like you are other customers/people, is a well-established application of AI. Today money laundering is detected through transaction rules; AI, through its machine intelligence, is able to find unique behaviors across many transaction behaviors and many customers, providing insights on who might be laundering money, as their behaviors are so much different than other customers. Follow-up: So why isn’t ML used widely in the industry since it’s such a huge and expensive problem? The industry is focused on working through money laundering scenarios and ensuring they show compliance in working all the alerts. The majority are false positive alerts, but they’re still worked because the bank needs to be in compliance with the regulation. Recently though, regulators are giving hall passes to allow innovative financial institutions to bring more machine learning into their operations. There was a good article about this in the Wall Street Journal earlier this week. It seems we are rapidly approaching a place where the difficulty in working in machine learning, EE, AI, etc. is the human side of understanding both solutions computers arrive at and the intricacies of the methods these being deployed. Is that inherently problematic? And if so what can be done about it, given that we cannot unwind the clock? ScottZoldi: This is a great point. Machine learning models need to be humanely understandable and the ML needs to speak in a language that we understand. There’s a class of work being done to derive narratives from machine learning models, meaning, what is the human story, the transaction, the event that caused the ML model to react? It will be super important as we as humans become more dependent on, and partner with, machine learning. Scott, how can we ensure that the AI and machine learning evolve to benefit the society and not harm it? What role, if any, are you and FICO playing in this regard? Detection of bias and understanding where models may not be reliable are two fundamental ways to ensure their intelligence is leveraged in ethical and responsible ways. At FICO we are spending a lot of time on the concept of ethical AI and algorithms the help uncover bias learned in machine learning models. Where do you see opportunities in blockchain given the most visible use case (cryptocurrency) has fizzled out? Is AI overhyped nowadays in your opinion? AI is still over-hyped but reality is setting in. Regulation, like GDPR, and the rise of model governance practices, is bringing us back to reality. These are complicated tools that need to be built carefully and monitored continuously. I’m curious about deep learning. I’ve heard its pretty powerful, do you think we’ll see it catch on? How does it compare to neural networks? Deep learning is really powerful in the area of image recognition and an interesting technology. However many experts feel that it’s NOT a great tech when you need to explain how it arrived at its decision. This may leave it squarely in the hands of the search engine giants. There are plenty of examples of how you can manipulate the images imperceptibly to get a different result … caution is required. P.S. Deep learning models are typically best viewed as neural networks with lots and lots of hidden layers, making them hard to understand. Focus needs to be on explainable architectures, not an arms race to bigger and more complex (and difficult to unravel) machine learning algorithms. 96 patents and you don’t have your own company? Do you enjoy the life of a minion? Ha ha, what I enjoy is working with more than 100 machine learning data scientists. 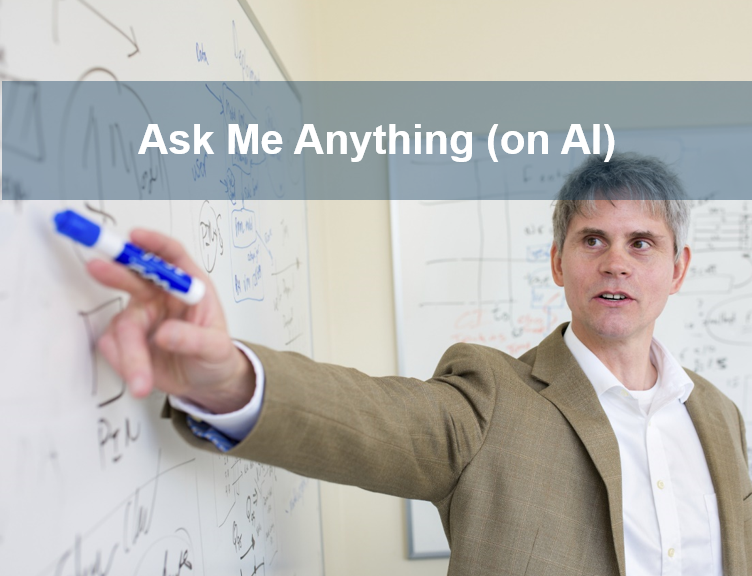 Be sure to check out my entire Ask Me Anything on AI, on Reddit. And follow me on Twitter @ScottZoldi.